Impact evaluation in philanthropy can be intimidating. Where do we start? How do we know we're doing it right? The questions pile up fast, but dependable answers are harder to find. Misconceptions about impact evaluation can leave grantmakers feeling disempowered. That’s why we created this guide. 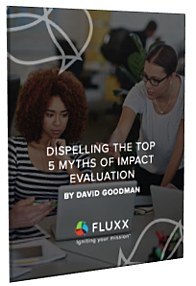 By busting these myths, we hope to clear the way for grantmakers like you to take the first steps in a successful impact evaluation journey. Download the whitepaper to arm yourself with the information you need to take your program strategies to the next level. Fill out the form on the right to get the whitepaper now.